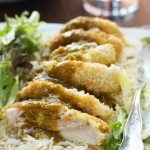 Essentially, this mustard parmesan crispy chicken recipe is a chicken schnitzel, which is always delicious. 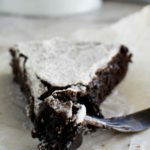 But this version is even tastier, and only takes a little over 15 minutes to make! Once upon a time, I ordered a humble chicken schnitzel lunch special at an Italian chain restaurant. 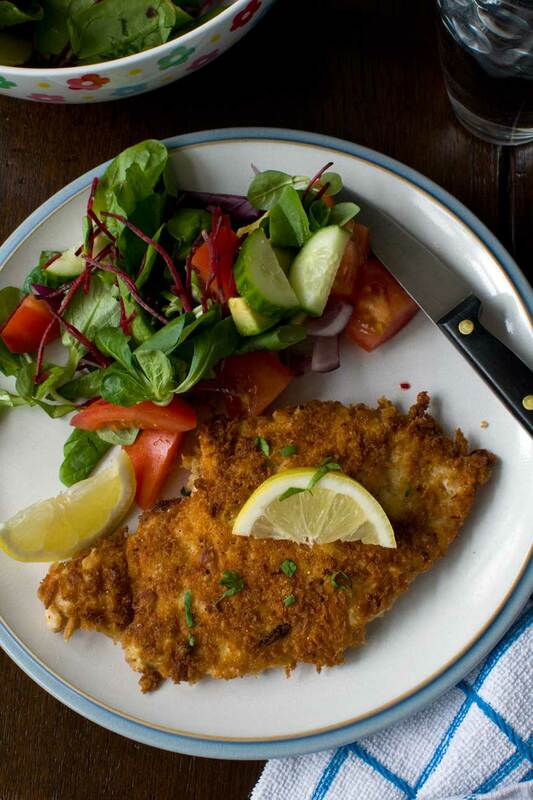 It was simple – just a flattened chicken breast coated in crispy crumbs and pan fried – with a lovely fresh salad on the side. With a cold glass of white it was lunch perfection! This was quite a long while ago now (and not the most exciting story in the world!) but I’ve been wanting to make chicken schnitzel at home ever since. But you know how it is sometimes – I’ve just never got around to it. Until about a week ago that is, when I came across half a box of panko breadcrumbs in the food cupboard I was clearing out before our big move. Then after fishing out a bit of leftover parmesan in the fridge it was a no brainer. Time to get out this mustard parmesan crispy chicken recipe! I told you I’d be making something with odds and ends from my kitchen again this week! My first attempt was a pretty basic parmesan chicken schnitzel, which was tasty, and lovely and crispy, but I couldn’t help thinking it could be even better. So I made this meal again for Mr. Scrummy and I and my lovely friend Mel who agreed to let me test a new version of the recipe on her. Brave girl! There are two ingenius things about this idea. One: you end up with a tastier crispy chicken. Two: it’s easier to make, because you don’t need to bother coating the chicken in flour and egg before rolling in the breadcrumbs as I did the first time. The mustard works just as well as egg as something for the crumbs to stick to. Mmmmm… so tender and crispy! So what makes this mustard parmesan crispy chicken recipe so great? 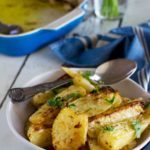 I think this is one of those recipes that makes a tasty midweek meal for yourself, but is also worthy of serving to guests. It’s a classy meal with a salad on the side, and perhaps some fresh bread, but your guests would never know it was so quick and easy to make! 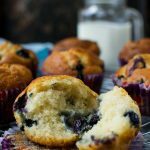 These are my favourite recipes! 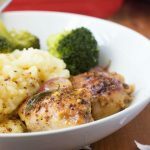 If you give this mustard parmesan crispy chicken a try, please let me know if you found it as satisfying as I did to make (and of course to eat!). I love that you don’t have to bother dipping in flour and egg, and I love how tasty and crispy the coating is. I even love pounding the chicken with a mallet so that it’s an even thickness before coating and cooking. Hmmm… I bet you can’t tell I’m a foodie. P.S. If you like all ze crispy things, something tells me you might enjoy these crispy halloumi fries! 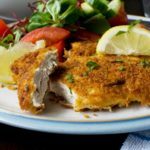 Chicken schnitzel always makes a delicious easy meal, but this version flavored with mustard and parmesan cheese is even easier to make. Mmm... tasty! fresh salad, warm crusty bread and a glass of fruity white wine! In turn, place each piece of chicken between 2 sheets of cling wrap (plastic wrap) and flatten to an even thickness with a rolling pin or wooden mallet (about ½ inch thick is ideal). Sprinkle each side of the chicken with salt and pepper. Mix together the mustard, herbs and garlic, then smear over both sides of the chicken with a brush or teaspoon. Mix the panko breadcrumbs with the parmesan, then scatter over a plate. Press the chicken into the mixture until both sides are fully covered. Heat the oil in a pan on a medium heat, then pan fry the chicken for about 3 minutes on each side, or until crispy, golden and cooked through. Serve immediately* with a big salad and crusty bread. 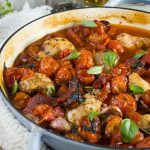 Tip: You may like to keep the chicken warm in the oven until you’re completely ready to eat, especially if your pan is too small to cook both breasts at the same time. It will still stay moist and crispy! 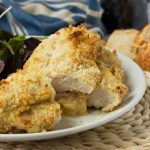 The amount of crumb mixture in this recipe is quite generous, but that is to allow for different sized chicken breasts! If you are using smaller chicken breasts, you could slightly decrease the amount of panko/parmesan if you like. 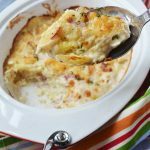 This recipe is really easy to adapt for more people. Cooking for 3? Just add another tablespoon of mustard, half a teaspoon more herbs and another clove of garlic to the mustard mixture, and a quarter cup more panko breadcrumbs with a large pinch of parmesan. Panko breadcrumbs are extra fine Japanese breadcrumbs. They're available in large supermarkets (at least here in the UK). If you can't find them, it's fine to use any kind of breadcrumbs really. 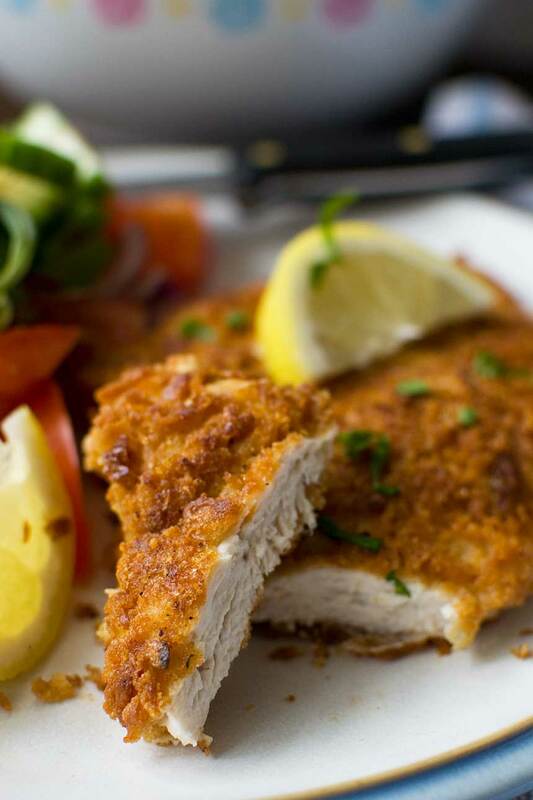 Panko will just make your chicken a bit crispier. There’s nothing better than a nice piece of crispy chicken and panko are the best for this. I love to useDijon as the perfect ‘glue’ for the breading and adds so much flavor. I know, it works perfectly, doesn’t it? I can’t believe I haven’t thought of this before! That looks so yum. I might wreck my diet and cook this quite soon. Good luck on your move to this part of the world …… to WA I presume? Thanks so much for the good wishes for our move. Just a couple of weeks to go! And yes, we’re off to WA… Perth. I have mixed feelings, but am trying to see it as an adventure! Hello Ann! Hahaha… it’s the universe speaking to you for sure! 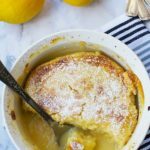 I really hope you enjoy the recipe – it’s become one of our staple mid-week go-tos. I don’t think you need to worry too much about the diet though as this is ‘only’ pan fried in just a little oil. I think you’ll be just fine! You wouldn’t believe how hot it was here. The problem of course is the humidity here. 30 degrees feels like 40 in Oz! Arraahhhhhhhhhh! I just noticed what you said. Wash your mouth out Helen, skip the parmesan indeed! I did make this crispy chook and loved it. No cultural difference. You suggested that I could reduce the parmesan to cut down on calories. Shock horror…parmesan is one of my personal food necessities so I definitely did not reduce the quantity. Thank you again for a yummy recipe. Ahhhh, I see! Well, I’m very happy you kept the parmesan then. So happy you enjoyed your meal, and thanks again for reporting back! Have a great day, Ann! Hi Marissa! It’s the lazy person’s version of schnitzel!! Ooooh man does this look good. Love the bold flavor and super crispy outside. Would be so good on a sandwich or in a salad, too! Hi Karly! Ooh yes, this would be wonderful as a sort of burger. With avocado, and tomato, and mayo… mmmm! 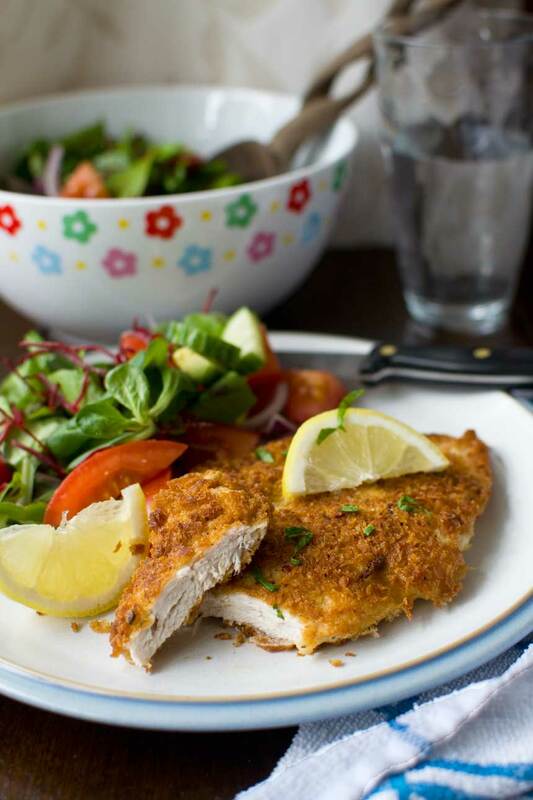 Love a good, real chicken schnitzel and this one looks so delicious. Thanks for another amazing recipe Helen! Hope you guys are doing well! Thank you so much, Mira. We’re doing OK thanks, although extremely busy organising our move. Hope you guys are well too!